Mutual driving school is based in Bow East London and it provides driving lessons for learner drivers in the surrounding area and throughout East London. The driving school is independently owned, it has been running for over 40 years and over time it has built up a good reputation. The driving school has a large number of positive reviews, with over 130 of these on Google. The company also responds to comments and reviews and this is a good sign. Driving schools which do so, are often quicker and easier to deal with, if anything should ever go wrong. From the comments left on their review page, Clement and Jimmy are two of their most popular driving instructors. The company also has a yell.com profile, where they have a 5 out 5 rating based on 4 reviews. If you are looking for reviews on their website, Mutual Driving School has a testimonial page, with a number of reviews from previous students. Mutual are very active on social media. Their Facebook page has 550 likes and 538 followers. They regularly post pictures of learner drivers who have passed with them and their page is updated frequently. If you would like to contact the driving school, you can do so through their contact page or calling the number listed above. If you plan on using a Mutual vehicle for your driving test, the cost is £83 for the test, which includes an hours practice beforehand. 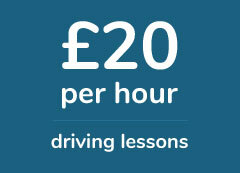 If you would like two hours practice before your test, the cost will be £103. The best thing about learning to drive with Mutual, is the constant feedback you get. I started out with one of the national driving schools and I never really knew what I had to work on, from lessons to lesson. My driving instructor with Mutual really coached and directed me throughout the lessons and I felt very comfortable with him. I'd had lessons in the past but stopped driving due to family commitments. Mutual were great at improving my confidence and helping me tackle things I found really difficult. After 3 or 4 lessons with them I felt at ease and I only needed a few more before taking my test. They are a good company and one of the better driving schools in East London. I booked refresher driving lessons with Mutual as I needed some help parking and driving on the motorway. The lessons were fun and I never felt bored or uninterested, I only needed a few lessons to brush away the cobwebs and after 5 or so hours I was good to go! Take it from a very nervous driver, Mutual are great! I was super nervous because it was my first time driving. My instructor was very patient and didn't rush me. It took me ages to get confident but eventually I did. If yo're nervous as well, Mutual can definitely help.